How do we justify the current market move ?? Fundamentals -> Technicals -> Psychological. What if technicals also cannot provide a solid reason? why markets move the way market moves? I generally prescribe to the fact that it is rather meaningless or futile to find out a reason for each and every one of the market move. Indian markets decoupled from the rest of the global markets !! The fact is that, you cannot make money or atleast I cannot make money if I have to depend on either one of the headline above to earn my daily bread. There are innumerable and countless variables involved and trying to fit the market move based on all or a subset of these variables becomes way too complex or at some stage becomes totally inexplainable. So what moves the markets then ?? Assuming market is a zero-sum (infact a negative-sum considering the slippage and commisions) game, we need to get our money from one of our fellow participant. We cannot all win at the same time over a long period of time and especially if we have a time-bound contract (derivative) for instance, then at the expiry of the contract some people lose and some win. But the fact remains the former ‘some’ is much larger when compared to the latter ‘some’. So if we are able to tune ourselves and position ourselves on the side of the winning ‘some’, then there is a chance that we will not only earn our daily bread but also earn a fortune in the long run. 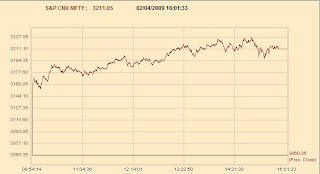 Given this scenario, majority of the people are bearish after Apr 10th, reasons aplenty, results start coming out, election uncertainity etc., etc., It is common view and every person participating in the market thinks that way. This is also proven by the fact that the implied volatility of ‘put’ options were much higher than that of the ‘call’ options and people are frantically buying 3000 and below strike puts which in my opinion might all go worthless and April could also be a month for NIFTY closing higher than last month. Using this reasoning as a base, when will I accept that I am totally wrong. If NIFTY falls below 2960 at any point in time before this expiry. Because at that time the majority of the bulls would have got trapped from the levels of 3200 and higher and it then becomes a level playing field for both the bulls and the bears and there might not be any edge to enter into the arena then. So the best would be to stay outside and watch the action if at all that happens.